Defects in cell death programs contribute to the pathogenesis and/or the progression of cancers, including leukemia. Apoptosis or type I cell death, one of the possible mode of cell death is regulated by caspases, a family of cystein proteases which functions to cleave a small number of key substrates that orchestrate apoptosis. This past few years, we have contributed to the identification and characterization of new caspase substrates during apoptosis of hematopoietic cells. Of note, we showed that the Src tyrosine kinase family members Fyn and Lyn are cleaved by caspases in cells triggered for apoptosis. This cleavage leads to the elimination of the N-terminal domain responsible for their anchorage into the plasma membrane and therefore induces their relocation into the cytoplasm and the nucleus of cells undergoing apoptosis. We also reported that ectopic expression of the caspase-cleaved form of Lyn protected various hematopoietic cell lines from different pro-apoptotic stimuli. To study the physiopathological relevance of this cleavage in vivo we generated transgenic mice expressing the caspase-cleaved form of Lyn and showed that LynΔ N mice displayed rapidly after birth a TNFα-dependent cutaneous inflammatory syndrom which recapitulates accurately human psoriasis. Moreover, we applied ourselves to identify and characterize alterations of cell death and differentiation processes in Chronic Myelogenous Leukemia (CML). CML is a stem cell disease resulting from an acquired cytogenetic abnormality due to the t (9 ; 22) translocation which codes for p210BCR-ABL a chimaeric protein endowed with a constitutive tyrosine kinase (TK) activity which is responsible for the insensitivity of stem cells from CML patients to cell death. Imatinib/Gleevec which blocks BCR-ABL activity has emerged as the leading compound to treat patients suffering CML. Despite very encouraging clinical results, resistance to imatinib is a major drawback because a minority of patients in chronic and a substantial proportion in accelerated phases are refractory to this treatment. Importantly, we recently discovered an important role for two TK, namely Fyn and Axl in the resistance to TKI. In addition, our recent findings suggest also alterations of apoptosis, autophagy and differentiation processes in CML, opening encouraging and original therapeutic perspectives for individual or combined targeting of these pathways, more specially in CML resistant patients. Finally, we initiated a new project concerning the anti-apoptotic protein Bcl-B. This new axis is in line with our previous project since it focuses on the function of the anti-apoptotic molecule Bcl-B on B cell differentiation and on the pathogenesis of multiple myeloma (MM). In this context, we have produced transgenic mice that express Bcl-B specifically in B lymphocytes. We are currently studying their phenotype which seems to recapitulate the main features of MM. The proposed project is in the continuity of the previous one and will include three main axis. Axis # 1 will continue to explore the mechanisms of resistance to TKI in CML. Several candidate proteins involved in resistance have been identified and the role of Fyn, Axl and some integrins will be more specially investigated in cell lines and primary cell from CML patients. In addition, our recent findings strongly suggest that targeting autophagy is an original and novel therapeutic possibility in this disease and likely for other hematopoietic malignancies. In this context, we have identified compounds that are able to eradicate TKI-resistant CML cells via different mode of cell death, the more relevant one being ACD. The molecular mechanisms highlighting the effect of these agents will be determined. Our goal is to propose in a near future clinical trials in CML using these compounds which have the advantage to be currently tested for other tumoral and non-tumoral pathologies. Interestingly, both molecules behaves as metabolic stress-inducing agents and their implication in the AMPK/mTORC pathway will be analyzed. In addition, as AMPK is an universal inductor of autophagy we will also investigate the role of autophagy in physiological hematopoietic cell differentiation. Several lines of evidence supports a crucial role of autophagy in erythroid differentiation and we reported recently that autophagy is important for megakaryocytic differentiation of the K562 CML cell line. The role of autophagy and cathepsins, a family of cystein proteinase involved in the regulation of autophagy will therefore be analyzed during erythroid and megakaryocytic differentiation of hematopoietic stem cells. Axis # 2 will be devoted to analyze the role of Lyn in keratinocyte biology and psoriasis. The main tasks of this axis will be to i) validate LynΔN mice as a new model of psoriasis, ii) characterize Lyn cleavage and caspase activation in keratinocytes in vitro, iii) uncover the molecular mechanisms responsible for psoriasis in LynΔN mice, iv) evaluate LynΔ expression and cleavage in human psoriasis and v) analyze the immune system of LynΔN mice. Axis # 3 will decipher the role of Bcl-B in the physiopathology of B lymphocytes and plasma cells. The recent generation by our team of a EµBcl-B transgenic mice model that recapitulates the main features of multiple myeloma was a prerequisite to study the physiological role of this protein. Moreover, the function of Bcl-B as an inhibitor of both apoptosis and autophagy will be also evaluated. Finally the possibility to shift Bcl-B activity from an anti-apoptotic to a proapoptotic function with specific small peptides will be used in order to validate new potential therapeutic strategies in MM. Bailleux C, Robert G, Ginet C, Re D, Thyss A, Sudaka I, Peyrottes I, Hofman P, Auberger P, Peyrade F. Successful re-treatment of a relapsed V600E mutated HCL patient with low-dose vemurafenib. Oncoscience. 2014 Dec 26;2(1):44-9. Marzag H, Robert G, Dufies M, Bougrin K, Auberger P, Benhida R. FeCl(3)-promoted and ultrasound-assisted synthesis of resveratrol O-derived glycoside analogs. Ultrason Sonochem. 2014 Jun 10. pii: S1350-4177(14)00181-3. Cluzeau T, Dubois A, Jacquel A, Luciano F, Renneville A, Preudhomme C, Karsenti JM, Mounier N, Rohrlich P, Raynaud S, Mari B, Robert G, Auberger P. Phenotypic and genotypic characterization of azacitidine-sensitive and resistant SKM1 myeloid cell lines. Oncotarget. 2014 May 27. Puissant A, Fenouille N, Alexe G, Pikman Y, Bassil CF, Mehta S, Du J, Kazi JU, Luciano F, Rönnstrand L, Kung AL, Aster JC, Galinsky I, Stone RM, Deangelo DJ, Hemann MT, Stegmaier K. SYK Is a Critical Regulator of FLT3 in Acute Myeloid Leukemia. Cancer Cell. 2014 Feb 10;25(2):226-42. Cluzeau T, Mounier N, Karsenti JM, Richez V, Legros L, Gastaud L, Garnier G, Re D, Montagne N, Gutnecht J, Gabriel Fuzibet J, Auberger P, Raynaud S, Cassuto JP. Monosomal karyotype improves IPSS-R stratification in MDS and AML patients treated with Azacitidine. Am J Hematol. 2013 Jun 11. Dufies M, Cassuto O, Jacquel A, Robert G, Auberger P. Ponatinib circumvents all types of imatinib resistance in chronic myelogenous leukemia cell lines. Cell Cycle. 2013 Jun 1;12(11):1645-6. Cluzeau T, Robert G, Jacquel A, Auberger P. How Recent Advances in High-Risk Myelodysplastic Syndrome Physiopathology May Impact Future Treatments. Curr Pharm Des. 2013 Feb 4. Robert G, Jullian V, Jacquel A, Ginet C, Dufies M, Torino S, Pottier A, Peyrade F, Tartare-Deckert S, Bourdy G, Deharo E, Auberger P. Simalikalactone E (SkE), a new weapon in the armamentarium of drugs targeting cancers that exhibit constitutive activation of the ERK pathway. Oncotarget. 2012 Dec;3(12):1688-99. Peyrade F, Re D, Ginet C, Gastaud L, Allegra M, Ballotti R, Thyss A, Zenz T, Auberger P, Robert G. Low-dose vemurafenib induces complete remission in a case of hairy-cell leukemia with a V600E mutation. Haematologica. 2013 Feb;98(2):e20-2. Wöhrle FU, Halbach S, Aumann K, Schwemmers S, Braun S, Auberger P, Schramek D, Penninger JM, Laßmann S, Werner M, Waller CF, Pahl HL, Zeiser R, Daly RJ, Brummer T. Gab2 signaling in chronic myeloid leukemia cells confers resistance to multiple Bcr-Abl inhibitors. Leukemia. 2013 Jan;27(1):118-29. Cassuto O, Dufies M, Jacquel A, Robert G, Ginet C, Dubois A, Hamouda A, Puissant A, Luciano F, Karsenti JM, Legros L, Cassuto JP, Lenain P, Auberger P. All tyrosine kinase inhibitor-resistant chronic myelogenous cells are highly sensitive to Ponatinib. Oncotarget. 2012 Nov 14. Auberger P. BCR-ABL/p62/SQSTM1: a cannibal embrace. Blood. 2012 Oct 25;120(17):3389-90. Puissant A, Fenouille N, Auberger P. When autophagy meets cancer through p62/SQSTM1. Am J Cancer Res. 2012;2(4):397-413. Jacquel A, Obba S, Solary E, Auberger P. Proper macrophagic differentiation requires both autophagy and caspase activation. Autophagy. 2012 Jul 1;8(7). Cluzeau T, Robert G, Mounier N, Karsenti JM, Dufies M, Puissant A, Jacquel A, Renneville A, Preudhomme C, Cassuto JP, Raynaud S, Luciano F, Auberger P. BCL2L10 is a predictive factor for resistance to azacitidine in MDS and AML patients. Oncotarget. 2012 Apr;3(4):490-501. Robert G, Puissant A, Dufies M, Marchetti S, Jacquel A, Cluzeau T, Colosetti P, Belhacene N, Kahle P, Da Costa CA, Luciano F, Checler F, Auberger P. The caspase 6 derived N-terminal fragment of DJ-1 promotes apoptosis via increased ROS production. Cell Death Differ. 2012 Nov;19(11):1769-78. Robert G, Gastaldi C, Puissant A, Hamouda A, Jacquel A, Dufies M, Belhacene N, Colosetti P, Reed JC, Auberger P, Luciano F. The anti-apoptotic Bcl-B protein inhibits BECN1-dependent autophagic cell death. Autophagy. 2012 Apr;8(4):637-49. Puissant A, Dufies M, Fenouille N, Ben Sahra I, Jacquel A, Robert G, Cluzeau T, Deckert M, Tichet M, Chéli Y, Cassuto JP, Raynaud S, Legros L, Pasquet JM, Mahon FX, Luciano F, Auberger P. Imatinib triggers mesenchymal-like conversion of CML cells associated with increased aggressiveness. J Mol Cell Biol. 2012 Aug;4(4):207-20. 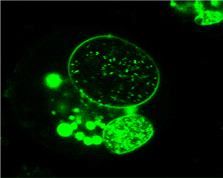 Jacquel A, Obba S, Boyer L, Dufies M, Robert G, Gounon P, Lemichez E, Luciano F, Solary E, Auberger P. Autophagy is required for CSF-1-induced macrophagic differentiation and acquisition of phagocytic functions. Blood. 2012 May 10;119(19):4527-31. Dufies M, Jacquel A, Belhacene N, Robert G, Cluzeau T, Luciano F, Cassuto JP, Raynaud S, Auberger P. Mechanisms of AXL overexpression and function in Imatinib-resistant chronic myeloid leukemia cells. Oncotarget. 2011 Nov;2(11):874-85. Dufies M, Jacquel A, Robert G, Cluzeau T, Puissant A, Fenouille N, Legros L, Raynaud S, Cassuto JP, Luciano F, Auberger P. Mechanism of action of the multikinase inhibitor Foretinib. Cell Cycle. 2011 Dec 1;10(23):4138-48. Abed C, Legrave N, Dufies M, Robert G, Guérineau V, Vacelet J, Auberger P, Amade P, Mehiri M. A new hydroxylated nonaprenylhydroquinone from the Mediterranean marine sponge Sarcotragus spinosulus. Mar Drugs. 2011;9(7):1210-9. Epub 2011 Jul 7. Genta-Jouve G, Francezon N, Puissant A, Auberger P, Vacelet J, Pérez T, Fontana A, Mourabit AA, Thomas OP. Structure elucidation of the new citharoxazole from the Mediterranean deep-sea sponge Latrunculia (Biannulata) citharistae. Magn Reson Chem. 2011 Jul 14. Thépot S, Lainey E, Cluzeau T, Sébert M, Leroy C, Adès L, Tailler M, Galluzzi L, Baran-Marszak F, Roudot H, Eclache V, Gardin C, de Botton S, Auberger P, Fenaux P, Kroemer G, Boehrer S. Hypomethylating agents reactivate FOXO3A in acute myeloid leukemia. Cell Cycle. 2011 Jul 15;10(14):2323-30. Cluzeau T, Robert G, Puissant A, Jean-Michel K, Cassuto JP, Raynaud S, Auberger P. Azacitidine-resistant SKM1 myeloid cells are defective for AZA-induced mitochondrial apoptosis and autophagy. Cell Cycle. 2011 Jul 15;10(14):2339-43. Pruvot B, Jacquel A, Droin N, Auberger P, Bouscary D, Tamburini J, Muller M, Fontenay M, Chluba J, Solary E. Leukemic cell xenograft in zebrafish embryo for investigating drug efficacy. Haematologica. 2011 Apr;96(4):612-6. Epub 2011 Jan 12. Puissant A, Robert G, Fenouille N, Luciano F, Cassuto JP, Raynaud S, Auberger P. Resveratrol promotes autophagic cell death in chronic myelogenous leukemia cells via JNK-mediated p62/SQSTM1 expression and AMPK activation. Cancer Res. 2010 Feb 1;70(3):1042-52. Puissant A, Colosetti P, Robert G, Cassuto JP, Raynaud S, Auberger P. Cathepsin B release after imatinib-mediated lysosomal membrane permeabilization triggers BCR-ABL cleavage and elimination of chronic myelogenous leukemia cells. Leukemia. 2010 Jan;24(1):115-24. Colosetti P, Puissant A, Robert G, Luciano F, Jacquel A, Gounon P, Cassuto JP, Auberger P. Autophagy is an important event for megakaryocytic differentiation of the chronic myelogenous leukemia K562 cell line. Autophagy. 2009 Nov;5(8):1092-8. Epub 2009 Nov 24. Marchetti, S, Gamas, P, Belhacene, N, Grosso, S, Pradelli, L, Colosetti, P, Johansen, K, Iversen, L, Deckert, M, Luciano, F, Hofman, P, Ortonne, N, Khemis, A, Mari, B, Ortonne, JP, Ricci, JE and Auberger, P. (2009).The caspase-cleaved form of Lyn mediates a psoraisis-like inflammatory syndrom in mice. EMBO J. 2009 Aug 19;28(16):2449-60. Cursio, R., Miele, C., Filippa, N., Colosetti, P., Auberger, P., Van Obberghen, E., and Gugenheim, J. (2009). Tyrosine phosphorylation of insulin receptor substrates during ischemia/reperfusion-induced apoptosis in rat liver. Langenbeck's archives of surgery / Deutsche Gesellschaft fur Chirurgie 394 :123-131. Engedal, N., Auberger, P., and Blomhoff, H.K. (2009). Retinoic acid regulates Fas-induced apoptosis in Jurkat T cells: reversal of mitogen-mediated repression of Fas DISC assembly. Journal of leukocyte biology 85 : 469-480. Essafi-Benkhadir, K., Grosso, S., Puissant, A., Robert, G., Essafi, M., Deckert, M., Chamorey, E., Dassonville, O., Milano, G., Auberger, P., et al. (2009). Dual role of Sp3 transcription factor as an inducer of apoptosis and a marker of tumour aggressiveness. PloS one 4 :4478. Gamas, P., Marchetti, S., Puissant, A., Grosso, S., Jacquel, A., Colosetti, P., Pasquet, J.M., Mahon, F.X., Cassuto, J.P., and Auberger, P. (2009). Inhibition of imatinib-mediated apoptosis by the caspase-cleaved form of the tyrosine kinase Lyn in chronic myelogenous leukemia cells. Leukemia. Grosso, S., Puissant, A., Dufies, M., Colosetti, P., Jacquel, A., Lebrigand, K., Barbry, P., Deckert, M., Cassuto, J.P., Mari, B., et al. (2009). Gene expression profiling of imatinib and PD166326-resistant CML cell lines identifies Fyn as a gene associated with resistance to BCR-ABL inhibitors. Molecular cancer therapeutics. Lavallard, V.J., Pradelli, L.A., Paul, A., Beneteau, M., Jacquel, A., Auberger, P., and Ricci, J.E. (2009). Modulation of caspase-independent cell death leads to resensitization of imatinib mesylate-resistant cells. Cancer research 69 : 3013-3020. Rolando, M., Munro, P., Stefani, C., Auberger, P., Flatau, G., and Lemichez, E. (2009). Injection of Staphylococcus aureus EDIN by the Bacillus anthracis protective antigen machinery induces vascular permeability. Infection and immunity. Alfa Cissé M, Louis K, Braun U, Mari B, Leitges M, Slack BE, Fisher A, Auberger P, Checler F and Vincent B. Isoform-specific contribution of protein kinase C to prion processing. Mol Cell Neurosci, 2008, 39: 400-410. Cursio R, Colosetti P, Auberger P and Gugenheim J. Liver apoptosis following normothermic ischemia-reperfusion: in vivo evaluation of caspase activity by FLIVO assay in rats. Transplant Proc, 2008, 40(6): 2038-2041. Cursio R, Miele C, Filippa N, Colosetti P, Auberger P, Van Obberghen E and Gugenheim J. Tyrosine phosphorylation of insulin receptor substrates during ischemia/reperfusion-induced apoptosis in rat liver. Langenbecks Arch Surg, 2009, 394(1): 123-131. Defamie V, Cursio R, Le Brigand K, Moreilhon C, Saint-Paul MC, Laurens M, Crenesse D, Cardinaud B, Auberger P, Gugenheim J, Barbry P and Mari B. Gene expression profiling of human liver transplants identifies an early transcriptional signature associated with initial poor graft function. Am J Transplant, 2008, 8(6): 1221-1236. Engedal N, Auberger P and Blomhoff HK. Retinoic acid regulates Fas-induced apoptosis in Jurkat T cells: reversal of mitogen-mediated repression of Fas DISC assembly. J Leukoc Biol, 2008, Sous presse. Frelin C, Imbert V, Bottero V, Gonthier N, Samraj AK, Schulze-Osthoff K, Auberger P, Courtois G and Peyron JF. Inhibition of the NF-kappaB survival pathway via caspase-dependent cleavage of the IKK complex scaffold protein and NF-kappaB essential modulator NEMO. Cell Death Differ, 2008, 15: 152-160. Puissant A, Grosso S, Jacquel A, Belhacene N, Colosetti P, Cassuto JP and Auberger P. Imatinib mesylate-resistant human CML cell lines exhibit high sensitivity to the phytoalexin Resveratrol. Faseb J, 2008, 2: 1894-1904. Sahra IB, Laurent K, Loubat A, Giorgetti-Peraldi S, Colosetti P, Auberger P, Tanti JF, Le Marchand-Brustel Y and Bost F. The antidiabetic drug metformin exerts an antitumoral effect in vitro and in vivo through a decrease of cyclin D1 level. Oncogene, 2008, 7(25): 3576-3586. Luciano, F, Jacquel, A, Colosetti P, Herrant, M., Cagnol, S, Pages, G and Auberger. Phosphorylation of Bim-EL by Erk1/2 on Serine 69 promotes its degradation via the proteasome pathway and regulates its proapoptotic function. Oncogene, 2003, 22, 6785-6783. Legros, L, Bourcier, C, Jacquel, A, Mahon, FX, Cassuto, JP, Auberger, P and Pages, G. Imatinib mesylate (STI-571) decreases the vascular endothelial growth factor concentration in patients with chronic myeloid leukemia. Blood, 2004, 104, 495-501. Luciano F, Zhai D, Zhu X, Bailly-Maitre B, Ricci JE, Satterthwait A, Reed JC. Cytoprotective peptide Humanin binds and inhibits pro-apoptotic Bcl-2/Bax-family protein BimEL. J Biol Chem, 2005, 280, 158-167. Larribère, L, Hilmi, C, Khaled, M, Gaggioli, C, Bille, K, Auberger, P, Ortonne, JP, Ballotti, R and Bertolotto, C. 2005. The cleavage of the microphtalmia-associated transcription factor MITF, by caspases plays an essential role in melanoma cell apoptosis. Gene Dev. 2005, 19, 1980-1985. Jacquel, A, Herrant M, Defamie V, Belhacene N, Colosetti, P, Marchetti, S, Legros, L, Cassuto, JP, Deckert, M, Mari, B, Paul Hofman, and Auberger, P. A survey of the signaling pathways involved in megakaryocytic differentiation of the human K562 leukemia cell line by molecular and c-DNA array analysis. Oncogene, 2006, 25, 781-794. Luciano, F, Krajewska, M, Ortiz-Rubio, P, Krajewski, P, Zhai, D, Faustin, B, Bailly-Maitre, B, Bruey, J.M, Lichtenstein, A, Kumar Kolluri, S, C. Satterthwait, A, Zhang, X.H and John C. Reed.